With a growing economy and an increase in tourism, now is the time for commercial air service to return to Salem’s McNary Airfield or SLE, and the campaign is in motion. 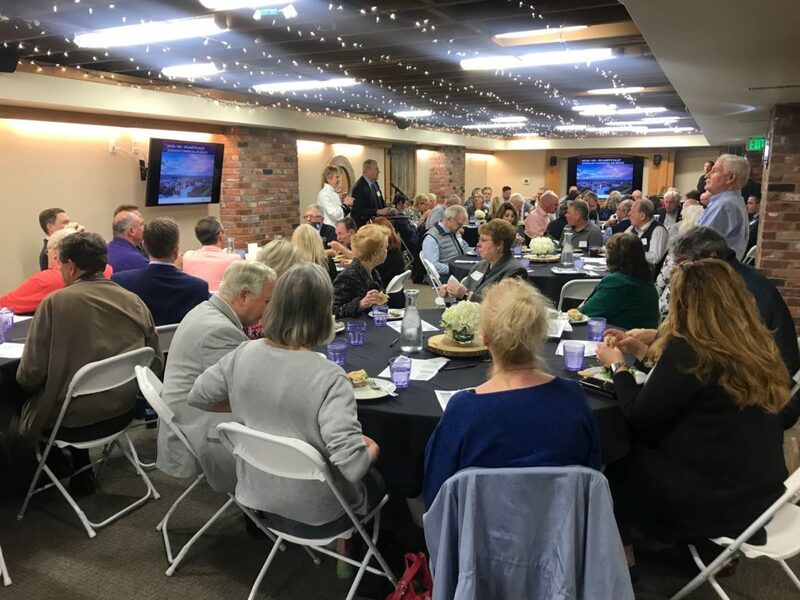 At a lunch hosted by Gayle Caldarazzo-Doty and Doug Doty at Ritter’s downtown in late March 2019, Brete Harrison and Brent DeHart gave updates on the progress and plans to have air service by 2020. March 2019 Commercial Air Service lunch – packed house! Nearly one year ago in June, the Salem Area Chamber of Commerce, SEDCOR, Travel Salem, and the Salem City Club hosted a national expert in community air service recruitment at a community lunch with 270 attendees. Jack Penning, managing partner of Volaire Aviation, made the case for Salem to reinstate commercial air service. Some of the shocking data includes only 10% of citizens in Salem alone (not even including other cities who would turn to Salem as a replacement for Portland) would need to fly out of Salem for commercial air service to be viable. The last time the city had commercial air flights out of the McNary Airfield was in 2008, when airlines left due to rising fuel costs and the lack of community buy-in. Commercial air service is largely possible if the community is willing to back it. Even with the rising costs back in ’08, Salem passengers still filled almost 80% of seats in commercial jets. The economy and desire for travel are luring aspects for national airlines, but the community must also pledge a revenue guarantee between $1.2 – $2 million dollars to persuade airlines to fly in and out of Salem (SLE). There is a great need for commercial air service out of Salem, and the community leaders at the June 2018 and March 2019 lunch are more than willing to pledge the money needed to convince airlines to fly in and out of Salem. Salem sees an average of 1.1 million annual passengers flying in and out of PDX per year, equivalent to 1,500 people coming and 1,500 going out of Salem per day. Salem flyers would be willing to pay more for a flight out of their hometown to forgo the traffic to PDX. It is not uncommon to hear about individuals leaving three, sometimes four, hours early to get to the airport to ensure they do not miss a flight due to unpredictable traffic patterns in Portland. The top three contenders for connecting flights out of Salem could be San Francisco, California; Seattle, Washington; and Denver, Colorado.